Ken brings 30+ years of finance experience to head up the QPF Toowoomba office. Kicking off his career at CBA, Ken’s passion saw him become the youngest ever Manager appointed by Toyota Finance in 1988. Drawing from this background and his reputation for refreshingly friendly customer care, Ken moved into a Finance Broker role in 1994, and in recent years has taken out numerous awards including BOQ’s National Finance Consultant of the Year, three years in a row! Specialising in finance for earthmoving, transport and agricultural machinery, Ken has financed everything from piggery growing sheds & veggie sorting machines, to aircraft and even a $1 million dollar peanut grading machine – he gives every deal a ‘red hot crack!’. Ken brings 30+ years of finance experience to head up the QPF Toowoomba office. Ken’s passion saw him become the youngest ever Manager appointed by Toyota Finance in 1988. 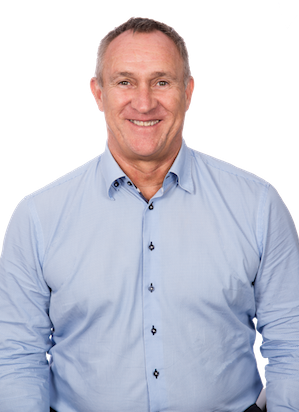 Ken moved into a Finance Broker role in 1994, and in recent years has taken out numerous awards including BOQ’s National Finance Consultant of the Year, three years in a row! What has Ken recently financed? On the 27th of January 1999, at the Gatton Post Office, Ken Gordon ran into the lovely Sally Petersen and offered her a job right then and there within his business - “Ken Gordon Financial Services”. The business was really taking off and another person was needed to help support that growth. Ken says “I had known Sal through doing business with a couple of Motor Dealerships in Gatton and I knew she’d be the perfect person given her work ethic, personality and profile in town." To this day, some 20 years on Sal is still working alongside Ken at the QPF Toowoomba. This week we are celebrating Sal, as 20 years is a mighty milestone! The QPF Finance family congratulates Sal on this massive achievement. Outside of work, Sal is quite the social butterfly. Whether it is being the life of the party at QPF functions, or spending time with her Friends & Family. Sal also enjoys relaxing holidays travelling overseas, drinking the finest wine and movie nights admiring Jason Momoa. Ken Gordon and his dedicated team have taken care of the business finance for our earthmoving business for over 12 years and the service delivered by Ken and his team is exceptional. We simply let Ken know what we need and he and his team follow through by liaising with the dealership, our accountant and our insurer – he makes it easy for us. Ken is always available to take our calls and we have no hesitation in recommending Ken to anyone requiring any type of finance. We have been customers of Ken’s since starting our business and he and his team have assisted us with purchasing our trucks and property. Ken makes everything easy. He is a pleasure to deal with and nothing is ever too much trouble. We would not hesitate recommending Ken and his team to anyone. Our family members are now also very satisfied QPF customers. So easy to deal with. Ken and crew are very friendly and so professional.